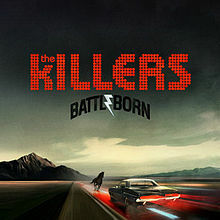 Battle Born is the fourth studio album by American rock band the Killers, released on September 17, 2012 on Vertigo Records in the UK and the following day on Island Records in the US. The phrase “Battle Born” appears on the state flag of Nevada, and is the name of the recording studio owned by the band in which the majority of the album was recorded. Recorded following an extended hiatus, the band worked with five producers during the recording of the album: Steve Lillywhite, Damian Taylor, Brendan O’Brien, Stuart Price, and Daniel Lanois.